GAT1. When we first identified SLC6A1 in 2015, we were surprised that a significant proportion of patients with disease-causing variants in this gene had a rare epilepsy phenotype referred to as Myoclonic Astatic Epilepsy (MAE). Typically, at the time of gene discovery, it is often unclear how far the phenotypic spectrum expands. In a recent publication in Epilepsia, we reviewed the phenotype of 34 patients with SCL6A1-related epilepsy. Surprisingly, in contrast to many other epilepsy genes that showed a broad and occasionally non-specific phenotypic range, the SLC6A1-related phenotype expands beyond MAE, but remains centered around generalized epilepsies with a predominance of absence seizures and atonic seizures. It is a gene that has started to write its own story. The SLC6A1 protein interaction network. 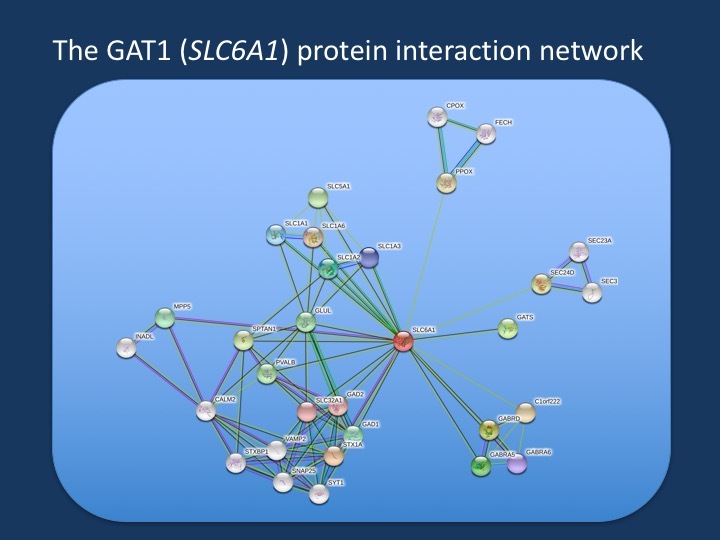 The central role of SLC6A1 (GAT1) in GABA metabolism is best explained by reviewing the protein networks that it interacts with. On the one hand, SLC6A1 interacts with GAD1 and GAD2, the glutamate decarboxylases that turn glutamate into GABA. These proteins, in turn, interact closely with many presynaptic proteins including STXBP1, SNAP25, and VAMP2. On the other hand, GAT1 interacts with SLC1A2 and SLC1A3, transporters for excitatory amino acids such as glutamate. SLC6A1. The SLC6A1 gene codes for the sodium- and chloride-dependent GABA transporter 1 and is the protein that removes GABA from the synaptic cleft. It is a central protein in GABA metabolism and is critical for regulating GABA, the main inhibitory neurotransmitter in the Central Nervous System. When we first described SLC6A1-related neurodevelopmental disorders, it became clear that many patients with disease-causing variants in this gene have epilepsy, specifically generalized epilepsies. Paradoxical mechanism. Disease-causing variants in SLC6A1 are typically loss-of-function, suggesting that a reduction of GAT1 function is the disease mechanism. This is somewhat counterintuitive given the epilepsy phenotype – it remains unclear right now how the presumed excess of GABA in the synaptic cleft may result in hyperexcitability. But as with many other epilepsy genes, biological insights into these apparently contradictory mechanisms may hint at novel pathomechanisms. The SLC6A1 phenotype. In our recent publication by Johannesen and collaborators, we review the phenotypes of 34 patients with disease-causing SLC6A1 variants including two families with several affected family members. Almost half of all patients had a phenotype compatible with Myoclonic Astatic Epilepsy (MAE), making SLC6A1 the gene with the closest association with an MAE phenotype to date. However, the phenotypic spectrum expanded significantly from our prior study. Seven other patients had other forms of generalized epilepsy, including Early Onset Absence Epilepsy (EOAE) and Eyelid Myoclonia with Absences (ELMA). We also identified two patients with focal epilepsies and three patients without seizures. With the exception of a single patient, all identified patients had some degree of intellectual disability. Mild to moderate intellectual disability with a focus on language development was the most commonly observed delay. In summary, the phenotypic spectrum of SLC6A1 is emerging as a relatively unique phenotypic range that is clearly distinct from other epileptic encephalopathies. A unique spectrum. I would like to emphasize again how unusual it is to identify a gene with such an unusual phenotypic spectrum. Most genes for neurodevelopmental disorders have a broad phenotypic spectrum and usually span the various epilepsy subtypes including Infantile Spasms or other infantile epileptic encephalopathies. SLC6A1 does not seem to follow this pattern, but remains a gene for generalized epilepsies. This spectrum also points out a close relationship of the various rare generalized epilepsies that are typically distinct from the more common Idiopathic/Genetic Generalized Epilepsies (IGE/GGE) such as Childhood Absence Epilepsy (CAE) or Juvenile Myoclonic Epilepsy (JME). This suggest some common biological pathways in patients with MAE and conditions such as Early Onset Absence Epilepsy (EOAE) and Eyelid Myoclonia with Absences (ELMA) and is reminiscent of the phenotypic spectrum of the 15q13.3 microdeletion and 16p13.11 microdeletion. What you need to know. In our recent study by Johannesen and collaborators, we describe the phenotypic spectrum in 34 patients with pathogenic variants in SLC6A1. The core phenotype of this gene is mild to moderate developmental delay with a generalized epilepsy that often presents as Myoclonic Astatic Epilepsy (MAE). Given this unusual phenotype, SLC6A1 emerges as one of the few genes for neurodevelopmental disorder with a relatively narrow phenotypic spectrum that sets the gene apart for the majority of other epilepsy genes. This entry was posted in 2018, SLC6A1 and tagged SLC6A1. Bookmark the permalink.